Steven Wilson at work in the old studio at his parents' bungalow, which was used to record most of Porcupine Tree's catalogue. Every new Porcupine Tree album sells over a quarter of a million copies. And with founder Steven Wilson in control of everything from songwriting to shrink‑wrapping, there's no middle man to take a cut. Porcupine Tree's brand of heavy progressive rock might not be to everyone's taste, but few would disagree that they make good‑sounding records. 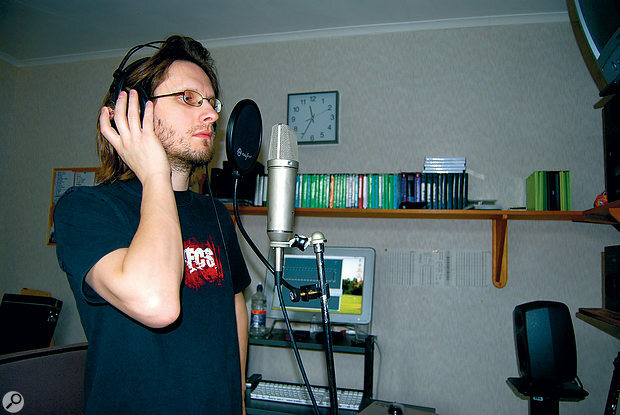 For the most part, these are conceived, written, demo'ed, partially recorded, mixed, and occasionally mastered in the modest home studio of singer, guitarist and founder Steven Wilson. Up until the summer of 2009, Steven's studio was still in his old bedroom in the bungalow he'd grown up in with his parents — he'd long since moved home himself, but was reluctant to vacate a room he knew so well. Only after 10 studio albums with Porcupine Tree has he finally moved studios, albeit to a room in his new home, a stone's throw from his parents' house. Steven freely admits that his real passion is recording, not necessarily performing on stage, even though Porcupine Tree are now a major live act. As soon as he became interested in music, he began experimenting with recording, pursuing a fascination with how sound can be warped and processed. "I fell in love with the weird and wonderful sounds I heard on records and wanted to know how to get them,” he explains. "I'm very fortunate to have a father who was an electronic engineer and able to build vocoders, echo machines and multitrack recorders for me. I'd play a record and say, 'Dad, how do you make that sound?' and he'd go off and figure it out. Porcupine Tree started life as a fictitious group, created by Steven to be the public face of a studio‑based experimental project. "I never meant to be a musician at all,” he laughs. "I meant to be a producer/songwriter, or someone who makes records. My love always remained experimenting in the studio, and that's a fairly solitary activity, so learning to play guitar, bass and keyboards and program drums has been necessary to achieve the other thing. I learned to program drums by trial and error and wasn't very good at it. If I'd had musicians around me I would never have had to, but I taught myself well enough to get at least some of what I heard in my head out into the real world. 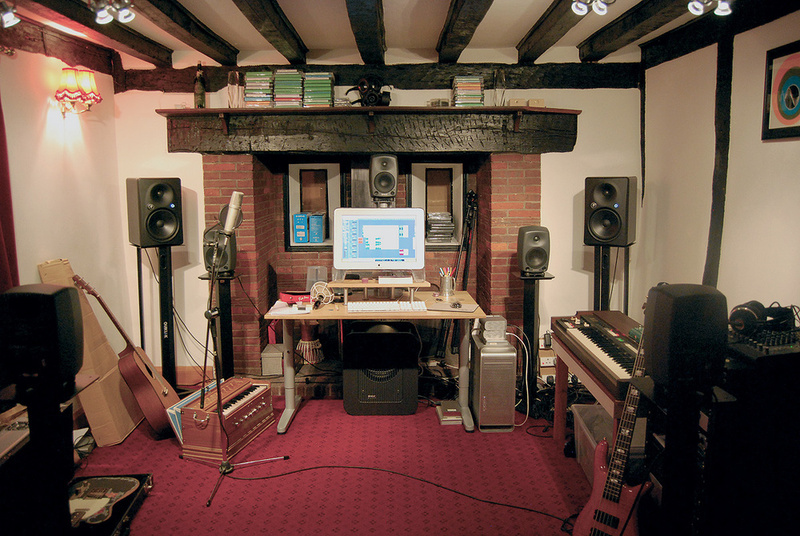 Steven Wilson's current studio is, again, a simple room in a domestic house. Over the years, Steven assembled a team of musicians to form a real band called Porcupine Tree, so now, by the time an album recording is complete, three others have added their contributions. 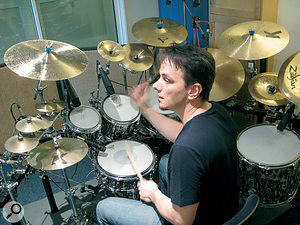 Drums are played by ex‑session man and King Crimson latest recruit Gavin Harrison, synths and pianos by Richard Barbieri, famed for his tenure as Japan's keyboardist, and bass by Colin Edwin. Yet it all still starts life as a fairly elaborate demo, programmed by Steven. "By the time we start tracking, the structure and tempo are worked out and I've programmed everything I can't play myself,” he explains. "I use soft synths and instruments inside Logic to program drum and bass parts, then play pianos and guitars and sing over the top. I play guitars in through an Apogee Trak 2 preamp and A‑D using amp simulators. That's not to say that I don't later go on to re‑track guitars, but at the demo stage everything goes direct. Then I hand the demo to the band and gradually we replace my feeble attempts. "The band work on top of that demo, which then ceases to be a demo because a lot of things on it make it onto the finished record. For example, 90 percent of the final vocals are the demo tracks. There is a very good reason for that, which is that when I cut the demo I've usually just written the song and feel closest, emotionally, to its sentiment. If I re‑cut it three months later, I'm no longer in that same emotional state — I'll have listened to that piece of music so many times that I have no emotional connection at all! It simply becomes a technical exercise in making the best‑sounding track. So I've learnt to work from the demo upwards, as the vocal is nearly always impossible to better. And I record things at the highest possible quality because, inevitably, there will be something I cannot recreate. Steven is arguably best known as a guitarist and composer, but his production skills have also impressed a great many listeners. Nevertheless, he is quick to admit that outside the home, where he records vocal and acoustic guitars, he makes full use of the talents of processionals with specific areas of expertise. "I rely on engineers,” he insists. "When it comes to miking guitar cabinets and drum kits, I always work with people who know what they're doing and, in that sense, I think of myself as a producer. I worked with Trevor Horn this year and he's someone who doesn't touch equipment. It was fascinating to see; he just sits and listens! He's a real old‑school producer, but has terrific engineers who do what he needs them to. 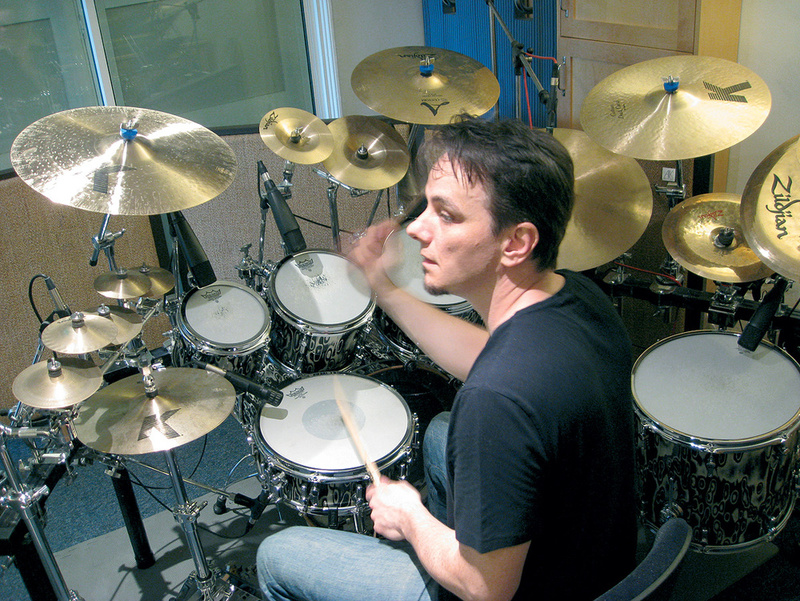 Porcupine Tree drummer Gavin Harrison records in his own purpose‑designed home studio.Long‑time readers of SOS might remember drummer Gavin Harrison's extraordinary home studio when it was featured in October 1999's Readerzone (/sos/oct99/articles/readerzone.htm). He'd just moved into a house with a sculptor's studio at the rear, which he turned into an acoustically treated live space alongside his control room. It is here that the Porcupine Tree drums are recorded before being sent to Steven for mixing. Steven: "Gavin's spent 25 years experimenting with microphones, mic positions, drum heads and all that stuff, so it is an incredible amount of expertise that I couldn't hope to achieve. If it has been recorded well, you don't need to do a huge amount, and that's certainly true of Gavin's recordings — I push the faders up and it sounds pretty good already. I don't add a lot of compression, just a bit of EQ and effect to balance things up. Surprisingly, for a guitarist, Steven claims that he doesn't know what he's doing with amps, so he travels to Florida and works with John Wesley, who plays guitar on stage with the band. "Wes knows everything there is about recording guitars, so I usually work at his studio for a couple of weeks. Again, I know when I like something and he knows me well enough to tell what I'm looking for, almost intuitively. 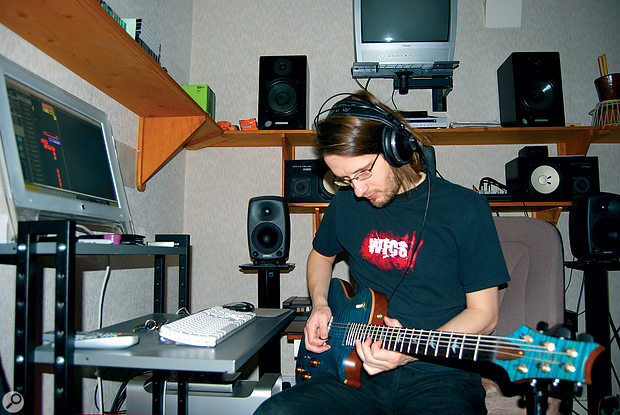 A fan of PRS guitars and a very talented player, Steven Wilson usually prefers to hire others to engineer his guitar recordings. Steven Wilson is emphatic about the importance of retaining control over every aspect of the physical product, and Porcupine Tree fans appreciate the high quality and innovative design of their releases. For vocals, rather than using a booth, Steven simply sets up his Neumann U87 in the middle of the room, plugged into the Apogee Trak 2 preamp/A‑D converter. "I just put on a pair of headphones and do it there,” he insists. "I use the Apogee's soft limiter to get rid of the real peaks and a 70Hz high‑pass filter for the low end. I don't even compress on the way in. "For processing, I like the Focusrite D2 EQ [Pro Tools plug‑in]. I do a lot of megaphone‑type vocals, and that's literally just the D2 with an incredibly high low‑pass and incredibly low high‑pass filter, around 2KHz. I also use Focusrite's D3 compressor, the Bomb Factory one, and [Line 6's] Echo Farm for old‑style tape delay type effects, which are transparent and warm in the mix. Occasionally I use reverb — I like [Digidesign's] D‑verb — but I'm not a big fan of it on vocals, I prefer delays, which take up less space. Porcupine Tree records now sell in huge numbers, but it has taken two decades of hard work to win what Steven calls a slow war of attrition. What's impressive is that, despite being largely overlooked by the mainstream music press, the band are actually selling more records than ever before, even at a time when downloads are killing record sales. It seems that Steven's success is all about providing a superior experience through his music, product packaging and live shows. "The people who listen to my music know that I'm not going to release something just to be commercial or get on the radio. I release records that I believe in, and if you do that, people trust your motives are genuine, so even if they don't always like the music, they're still prepared to listen. Now that progressive rock is no longer a dirty word, we are starting to get more media coverage, but for years it was just people telling their friends. It was never planned or contrived. 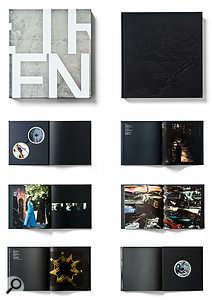 Fighting back, one of Steven's strategies has been to release a large number of limited‑edition products with special packaging, all of which are snapped up by fans. 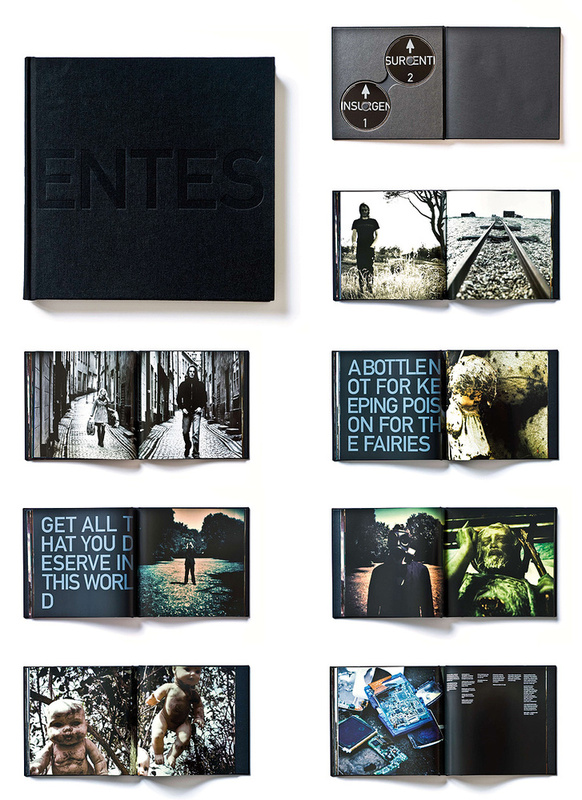 These include DVDs with visuals produced by his filmmaker friend Lasse Hoile, elaborately packaged, limited‑edition books and coloured heavy vinyl editions, as well as Digipak, Digibook and mini‑LP CD releases, all given a consistent visual style by designer Carl Glover. 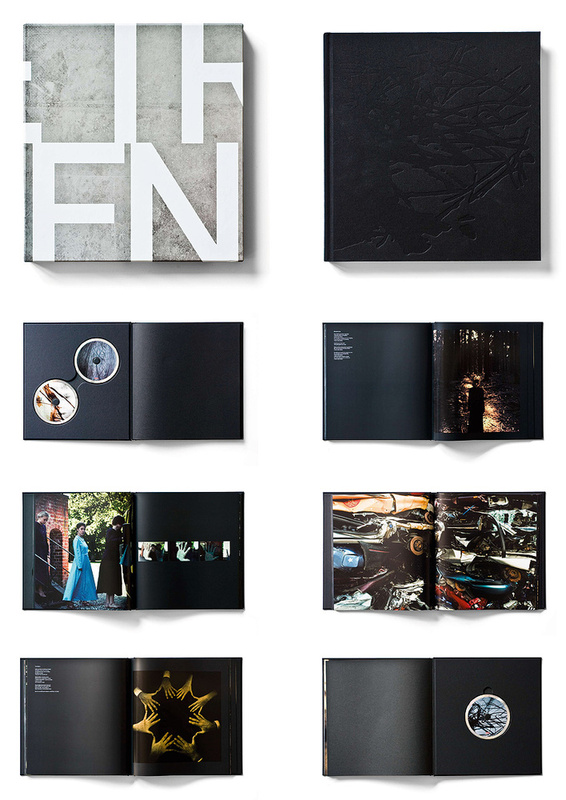 The perfect example of this approach is Steven's ambitious solo album project, Insurgentes, initially released in 2009 as a limited deluxe edition of 4000 10‑inch hardback books containing 120 pages of images and a choice of either four audio CD/DVDs, or four 10‑inch vinyl discs. 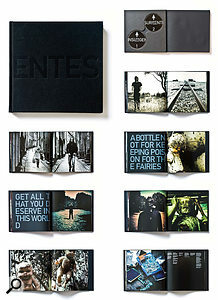 The expensive packaging paid off, with all copies selling out in advance. For secondary Porcupine Tree releases such as 'unplugged' albums and radio sessions, and for his Bass Communion side‑project, Steven has set up his own Transmission and Headphone Dust labels. "Bass Communion is specialist music that sells directly to people who like that kind of thing, so it is pointless putting it with a record company who are only going sell it mail‑order themselves. Steven Wilson is in the enviable position of having a great deal of success while retaining control of his own work, but in the early days he had to subsidise his career through commercial music. A golden opportunity came when a film‑maker friend of his asked if he wanted to try doing a Metallica soundalike track for an ad he was working on, because the rights to the real thing were not available. "I'd never made anything that heavy before,” he insists, "but I bought a Metallica album and tried to copy it. It was pretty bad but satisfied the advertising agency, and once you get your foot in the door they keep coming back. In the end I had a reel of stuff, so I registered with an agency and got more work through that. "The key is to keep your own music free of commercial consideration, and the best way to do that is to not have to worry about money. Commercials paid very well and meant I didn't have to compromise my own music, which remained pure self‑indulgence.